Marketers have been leveraging psychological tactics to influence consumer behavior for decades—and there’s no denying the psychological triggers that drive the oh-so-frustrating but effective clickbait headlines. Now imagine if we could apply these methods to recruiting! The Inside the Mind of Today’s Candidate report aims to help you with that. An in-depth look at 14,000 global professionals and their job-seeking attitudes and habits, the report combines data-driven insights with a deep understanding of human behavior in order to reach, influence, and recruit talent. In this post, we take a look at a set of particularly practical insights: improving your InMail response rate. But we also know that sending a 5-paragraph essay usually doesn’t work. InMails over 200 words tend to get lower response rates, while ones with fewer than 100 words get higher response rates. Here are five psychological tricks that will help you give candidates what they want (information), while also getting you what you want (a response). 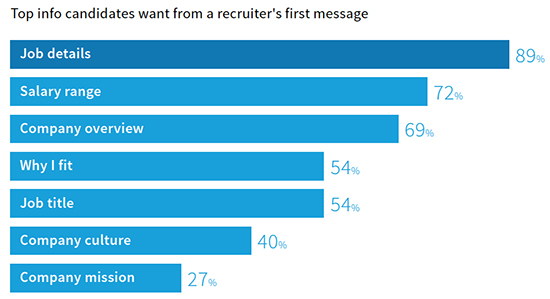 According to the data, almost the majority of candidates want job details, salary range, and a company overview to be included in a recruiter’s first message. While candidates claim to want all this information, they’re actually less likely to respond if you tell them everything. This disconnect—between what candidates want and what actually gets them to respond— is due to the information gap theory of curiosity. First coined by George Loewenstein, a behavioral economist and professor at Carnegie Mellon, it describes the disparity between what we know and what we want to know. When there’s a gap between the two, we feel compelled to seek out the missing information. Think of it like a mental itch we have to scratch. So when you’re drafting an InMail to a potential candidate, be sure to hold back a few enticing bits of information to keep the candidate intrigued. Try mentioning the position and the company but leaving out the salary. You’ll spark the candidate’s curiosity and career FOMO and they’ll be itching to respond to you. Sending a single, personalized InMail—as opposed to sending bulk messages to many candidates—will increase your response rate by 30%. This is true for a few reasons. Studies show that people are more motivated to help others when they feel uniquely qualified to do so. By making your InMail about the candidate’s strengths, you’re showing them how they might fit into and help this new organization and increasing your chance of a response. Another study revealed that being given a compliment stimulates the brain in the same way as being given free cash. Considering the fact that 63% of those surveyed for this report said they feel flattered when recruiters contact them, sending a personalized, complimentary InMail will work to your advantage. We suggest addressing candidates with “you” sentences. 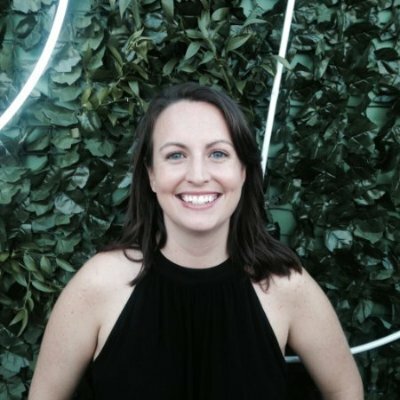 For example, instead of saying “I have a developer job that pays X,” make your message candidate-centric by saying something like “You have the mobile expertise to lead our team.” Let candidates know why you’re reaching out to them specifically and be sure to devote a few sentences to what you know about their skills and experience. Harvard Business School professor and psychologist Amy Cuddy suggests that people quickly judge others based on two factors: competence and warmth. The previous trick covers competence—when you customize your message, you’re demonstrating that you’ve done your homework and you know what you’re doing as a recruiter—but showing warmth can be a bit harder to pull off via text. Our advice is to forget the corporate jargon and formalities. Write like you speak—whether that means being funny, enthusiastic, or whatever other trait makes you, you. You can always make sure your message sounds natural by reading it out loud to yourself. Using humor is also an easy way to turn your cold InMail into a warm one, but don’t overdo it with slang or inappropriate jokes. Candidates are more inclined to respond to someone they like, and according to psychologist Robert Cialdini, people like those who are similar to them. This is especially true when people are similar in an uncommon way, as it lets them feel like they fit in and stand out at the same time. If you can, find something you share in common with the candidate and include it in your InMail. Look through a candidate’s LinkedIn interests and their social networks in order to see if you can spot any common ground. This may be an alma mater, a mutual friend, or even a shared interest. Look for a rare connection—a shared unicycling hobby is more interesting than a shared U.S. citizenship. According to this report, 56% of job-seekers are more likely to respond if the hiring manager reaches out to them. Indeed, the hiring process always goes more smoothly when the recruiter and hiring manager work as a team. So get your hiring manager involved, even if you have to draft the message you want them to send yourself. In his book, Influence: The Psychology of Persuasion, Robert Cialdini argues that people respond to authority often without even realizing it. And that’s what makes this tip so successful. Think of it this way: are you more inclined to buy medicine with a label that says “doctor recommended” or without? In the same way, many candidates see hiring managers as having more authority, so they’re more likely to reply to them. While they’re not full on Jedi mind tricks, these five psychological tips offer an easy, scientifically backed way to make sure your message is heard. Be sure you use them for good!